A new dress for a new year. I put a lot of stock in beliefs such as “like attracts like” and the “Law of Attraction”. So, I contemplated some of the simpler things I would like to do this next year such as go to new places, do new things, and improve my appearance. Consequently, I need a way to show my intent with both a limited time frame and a “vintage” skill set. What says, I want to go places, do things, and look good? – A new dress. So, I spent New Year’s Eve making a new dress. While this dress was a quick and uncomplicated project, there are many factors and steps to take an idea and making something to wear from it – something that fits. New Year’s Eve calls for some namesake wine, courtesy of my sister. Thanks, Jennifer. To begin with, I found myself in Gainesville with extra time. What better place to waste a bunch of time than Joann’s Fabric? They had none of what I was looking for, of course. However, I decided to breeze through the pattern books while trying to hold my breath around people hacking and coughing without covering their mouths. 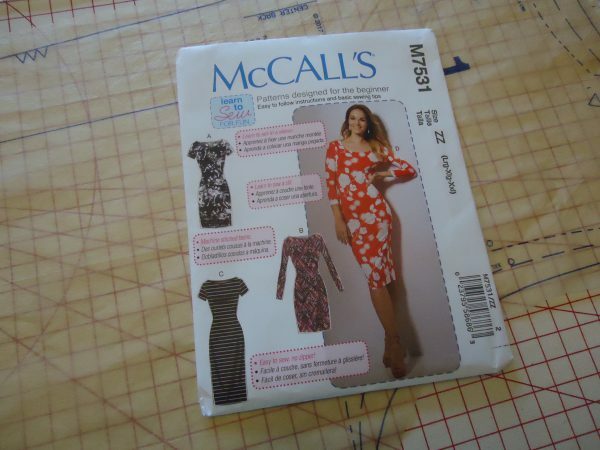 McCall’s patterns were on sale for $1.99, so I should buy three, right? I seldom find patterns I like at any price, but this day I found three. Additionally, I almost never find the fabric I like at a price I’m willing to pay. However, this day I found two bolts of fabric I liked, one was on sale and I had a coupon for the other. I bought a couple yards of each fabric, a zipper, and matching thread. I pulled out the instructions to read them in the store – I’m guilty of doing this, all the time. Many times, I’ve neatly refolded the instructions and put the pattern back. While I’ve been sewing for nearly 30 years, if I think there are too many pattern pieces or the instructions seem too finicky, then I lose interest. It’s important to know your measurements, not your size. 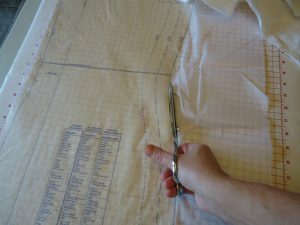 I know my measurements, and when the lady at the cutting counter told me there was no way I could possibly take that size pattern, I second-guessed myself. Unfortunately, she was wrong, and this demonstrates why we must go by measurement. Also, she told me I had the perfect figure for the dress I’m making, so she instantly became my favorite person. One of the fabrics I bought was a stretchy knit. I think I tried to make something from a knit 15 years ago, and it was a disaster. So of course, this is the dress I decide to make on New Year’s Eve. 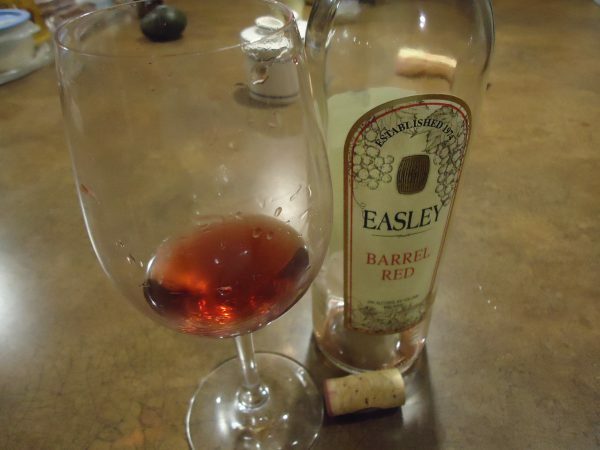 Fortunately, this pattern is marked “Easy” and it lived up to its advertisement. I decided I want to keep this pattern, so I was determined to preserve it. 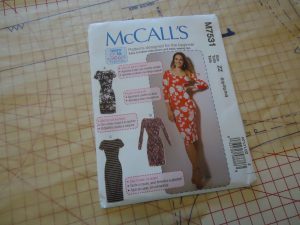 I’m using McCall’s pattern #M7531. It’s suitable only for 75% 4-way stretch knits. Launder fabric as the garment will be laundered. 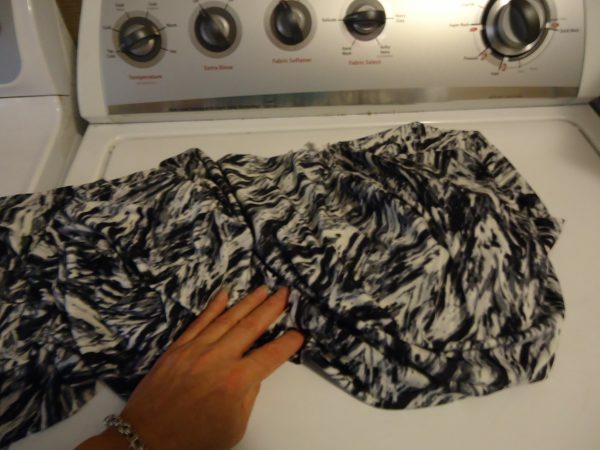 Per fabric care instructions. Cut reinforced pattern pieces out close to the line. 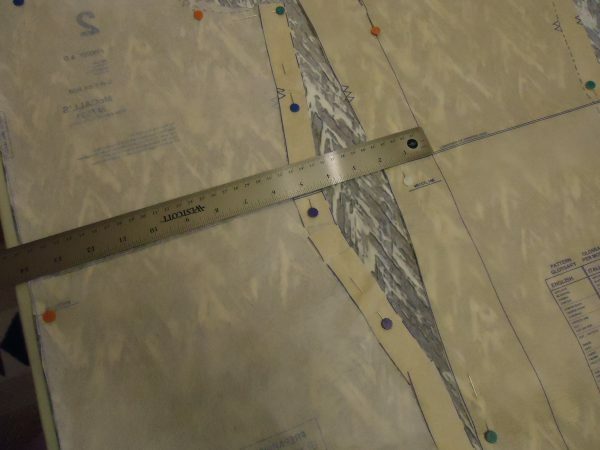 Lay out fabric and pin pattern. Pay special attention to grain-line, waistline, and hemline. Laying out and cutting is a skill. It sounds simple, lay out your fabric, pin or weight your pattern, and cut. However, if you’re going to go through the trouble of constructing your own garments, you want them to hang right on you. 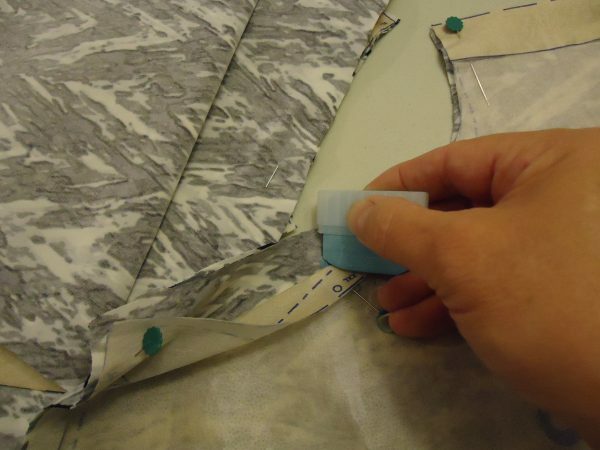 Therefore, lining up the waistline marks from pattern pieces, measuring grainline marks with the fold, and careful cutting without stretching or lifting the fabric are paramount. I even go through the silly ritual of transferring the marks from pattern to fabric, even though I know I’ll only barely see them when I need them. Even the machine needs a bit of attention, from replacing the needle and threading, to checking the stitch on fabric scraps from the cutout. I tested several stretch stitches on my machine to get them right and decide what I liked the best. 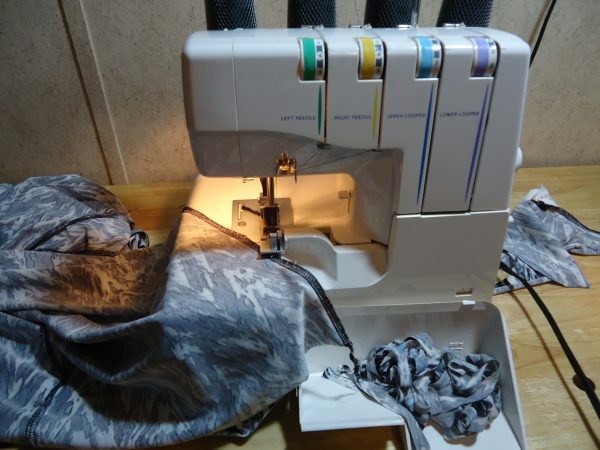 In the end, I chose my overlock-serger for most of the garment’s construction. However, I reverted to my regular machine for setting in the sleeves, turning down the neckline, and hemming the sleeves and bottom. Most of the construction was nearly effortless. The most problem I had was with the slinky nature of this knit. It was hard to get from cutting table to serger while keeping my seamline matched up. I found the need to pin – a lot. Typically, I avoid pins as much as possible around my serger. Also, the instructions for several areas include a double basting line. While basting the second line, I found the hem allowance would pucker, ripple, move, and stretch. I applied Wonder Tape to the allowance, but I don’t care for this product and it’s not the easiest stuff to remove – even though it dissolves. In the future, I may use a spray starch to stiffen and subdue the slinky and stretchy nature of this type of fabric. However, hand-basting the second line would have worked had I thought of it at the time. The best stitch for basic construction is my serger. 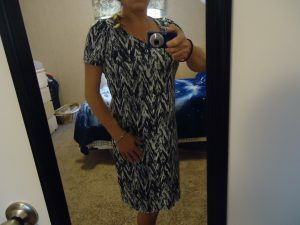 While hems, set-in sleeves, and neckline require my regular machine. As wine-o’clock was fast approaching, I tried the dress on before I set in the sleeves. Yea! It fits. I decided the best thing to do was set the sleeves in the morning. After the sleeves were finished only the bottom hem remained. I’ve learned the hard way to allow the garment to hang for a day before hemming. Late that night, I hemmed the bottom, then washed it. I allowed it to tumble in the dryer with no heat (per fabric care instructions) then I hung it when it was nearly dry. In the morning, I gave it a final press, trimmed the hem allowance a tad more, and gave it a home in my closet. Close up. Ignore the mess in the background. Still needs a hem. So, I’ll face this new year with a lot of excitement. I have so much to be thankful for, and I intend to live my life to the fullest this year. Garment making is a multi-stepped process, but it’s all good in the end. Now, I need new heels. A website devoted to learning, sharing and teaching a wide range of fiber arts. Inkle, Tablet and Navajo style weaving, Spinning, Knitting, Crochet, Sewing and Lace Making. Silver Work, Beading and Tool Making grace my bench as well. I wanted you to know that I successfully made a small navajo loom and did a test piece thanks to you. I own 4 Navajo rugs that I bought at the Crownpoint auction many years ago and although I have no weaving experience I decided I wanted to understand how they are made. I could not have done this without your videos and excellent instructions. I am now starting to warp a new piece that I want to send to my aunt who is an excellent weaver (and has a massive floor loom) and is battling cancer. Thank you for making this possible. Thank you for your kind words and for taking the time to write. I’m glad you found the videos useful. It warms my heart when I find out people have put them to good use. You can understand the process from reading, then it clicks when you watch it, but you really learn it when you perform the techniques yourself. It comes down to practice and muscle memory. It’s a great gift for a weaver to receive something woven just for them. They know the hours, effort and love that was poured into it. Let me know how your weaving progresses.